On Sale Now! Free Shipping Included! 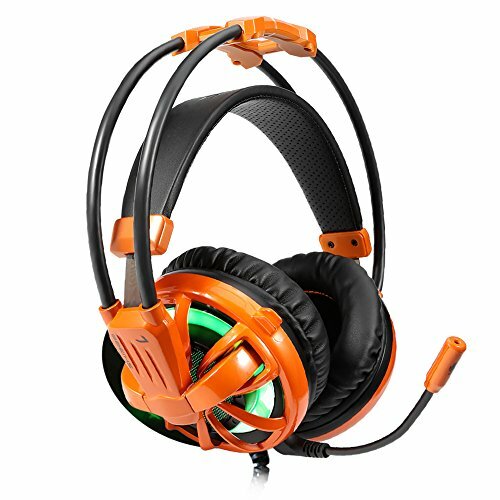 Save 3% on the iNcool Stereo Gaming Headset, Noise Cancelling Mic Over Ears Gaming Headphones with Microphone by iNcool at Pacs BG. MPN: PD01e6t43. Hurry! Limited time offer. Offer valid only while supplies last. GREAT HUMANIZED DESIGN: Superior comfortable and good air permeability protein over-ear pads, acord with human body engineering specification can reduce hearing impairment and heat sweat.Skin friendly leather material for a longer period of wearing. Glaring LED lights desigend on the earcups to highlight game atmosphere. EFFORTLESSLY VOLUME CONTROL: High tensile strength, anti-winding USB cable with rotary volume controller and key microphone mute effectively prevents the 87-inches long cable from twining and allows you to control the volume easily and mute the mic as effortless volume control one key mute. EASY AND CONVENIEN TO USE: This headset is NOT USB-Headset, The USB interface is only used for power supply to LED light. No driver needed, Plug and play.Exquisite craftsmanship and fashion appearance. If you have any questions about this product by iNcool, contact us by completing and submitting the form below. If you are looking for a specif part number, please include it with your message.